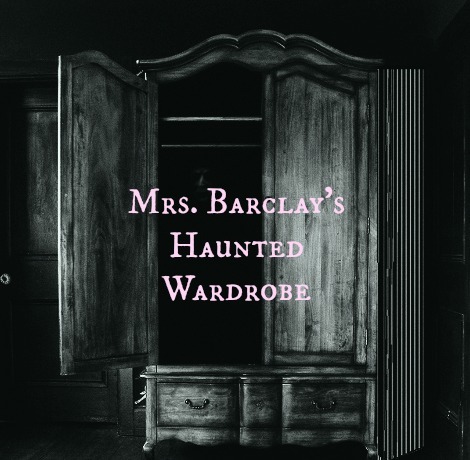 "FOR SALE--Haunted wardrobe.--Advertiser will be glad to deliver same to anybody interested, complete with ghost, which would also no doubt feel more at home if welcomed.--Write Mrs. B. Barclay, Carterton Manor, Oxon." It seems that three years earlier, she visited a sale of various items at a home in Berkshire. She noticed a 7' high Victorian wardrobe. Although there was nothing remarkable about the piece, it appealed to Mrs. Barclay, and she paid £10 for it. She placed it in the guest room of her house, and life went on its usual uneventful course. A little over two years later, she and her servants began to hear odd knocking sounds throughout the house. They were unable to find the source. Several of her houseguests tentatively commented that there was something...well, odd about the wardrobe. Throughout the night, its doors would loudly open and shut. After her guests had left, Mrs. Barclay monitored the wardrobe and found that, sure enough, those doors had a mind of their own. When she tied string around the doors, they would break their bonds and continue unabated. She thought there must be some sort of hidden mechanism causing the strange activity. However, when she tried to examine the wardrobe, one of the doors flew off, smashing a mirror. After that, she decided the thing was best left alone. Although Mrs. Barclay was leaving the wardrobe in peace, it wasn't returning the favor. The banging noises intensified in volume and frequency. Then, she began seeing the figure of an elderly man in old-fashioned clothing and a deerstalker hat emerging from the wardrobe and walking out of the house. Her secretary and her brother saw him too. This uninvited visitor was really beginning to get on Mrs. Barclay's nerves. As she later complained, "I am not psychic, nor am I nervous, but this wretched ghost will make such a noise. He clatters across the landing, and shuffles down the stairs, and the noise is often exasperatingly loud." Her friends, not wishing to share a guest bedroom with a noisy ghost, began to refuse her invitations. After the spirit kicked her butler in the shins, he gave his notice and left. Her surviving household staff muttered about quitting en masse. Mrs. Barclay herself had to resort to sleeping outdoors, just to get a little quiet. After her cook walked out on her, Mrs. Barclay--rather late in the day, one might think--realized that this damned--in every sense of the word--wardrobe just had to go. Hence the soon-to-be famous "Morning Post" ad. After her notice appeared, Mrs. Barclay soon realized that ghosts are not the only noisy pests. She was continually harassed by ghost-hunters, self-described psychics, aggressive looky-loos, and cranks of every variety. Visitors came from as far away as America. Morons kept themselves entertained by dressing in white sheets and prancing around her grounds. She received offers for the wardrobe from a college of astrology. From a quartet of spinsters who said they wanted the ghost to guard their house during the night. (A watchghost?) "Can you guarantee ghosts?" one message said. Another asked if the spook would be happy in a "small modern house." Mrs. Barclay was showered with unsolicited advice from self-appointed Ghost Experts. One opined, "I should say it's doubtful if the ghost will go with the wardrobe. He shows himself to you as you are sympathetic, but he may not do so to others...Leave the door open at night so that he can come in and out, and put a nice comfortable chair beside it for him, as he clings so to the wardrobe...Never mind the cook, cooks are plentiful, but you can never get another wardrobe like this." By now, Mrs. Barclay was desperate to just put the whole mess behind her. She sold the wardrobe--and, she sincerely hoped, the ghost as well--to a Mr. Rundle for £50. He owned an inn in nearby Clanfield, and no doubt shrewdly assumed the famed wardrobe would attract visitors. "My inn is being rebuilt," he told a reporter. "At the moment there is no room large enough for the haunted wardrobe, but I am having my own bedroom enlarged, and then I shall have it put in there. Anyone who wants to sleep in that room will be at liberty to do so. But personally, I do not believe in ghosts." Rundle temporarily lodged his new acquisition in the rather undignified setting of an outhouse. Unfortunately, by buying the wardrobe, he also acquired the same crowd of pranksters who had so bedeviled Mrs. Barclay. Boys and young men came from miles around to hoot, catcall, throw brickbats at the outhouse, and generally raise hell. Although Rundle maintained his skepticism about the supernatural, even he soon had to admit that this was one peculiar wardrobe. On the first night it was on his property, the doors of the wardrobe began shaking violently, from no discernible cause. His wife noticed that it sometimes emitted curious bangings and a "noise like an aeroplane." As many of the letters sent to Mrs. Barclay had theorized that the ghost was searching for something hidden in the wardrobe, Mr. Rundle took it apart. He found nothing unusual. Oddly enough, disassembling the wardrobe appears to have broken its curious spell. After it was put back together, the wardrobe became just another dull piece of Victorian furniture. The strange noises and shakings ceased, and the old man in the deerstalker hat was never seen by anyone ever again.